There’s a puzzling but common conundrum on the modern automotive landscape: it seems that the more money you spend on a face-melting hypercar, the less actual driving it will let you do. It’s not about the gathering cloud of autonomous vehicles and artificial intelligence that casts a pall over the entire industry. Instead, it’s the sacrifices that have been made by the world’s most performance-focused brands as they harness reams of silicon and deploy armies of electronic nannies in a bid to relentlessly chase the fastest lap times, quickest acceleration numbers, and heaviest cornering g-loads. It might seem unusual to use a term like ‘sacrifices’ to describe the seemingly endless torrent of speed-enhancing technologies that have poured forth from some of the most talented automotive engineering minds on the planet. And yet, for every half-second pared away, or single-digit mile-per-hour improvement made by electronically-controlled hybrid drivetrains, larger turbocharged lungs, or precisely-tuned launch control systems, there’s an equal loss to be made on the human side of the steering wheel. In an age where hypercars are increasingly designed and then driven by computers, with only as much human involvement as required to turn the wheel and stomp the gas pedal, one man’s dream of building something that could tap in to the sheer visceral pleasures of motoring while still keeping pace in the frenetic world of world-class performance takes on an almost crusade-like quality. Norman Choi’s decision to not only revive the glory of the Apollo brand but to take a firm stand and fight for those who are still passionate about their connection to the asphalt carves out a unique identity for both the man and his machine. If the name sounds familiar, that’s because it’s been on the tip of the tongue for the last 15 years or so of Europe’s supercar narrative. Originally known as Gumpert Apollo, and dedicated to building track-focused weapons that just happened to also be street-legal, the financially-floundering automaker was purchased in 2016 by Choi and rededicated to finding its place in the performance pantheon. Its first order of business? The Apollo IE, or ‘Intensa Emozionale,’ which marries jaw-dropping design with a level of driver engagement not seen since ones and zeros took over the left seat. That last statement might only take up a handful of words on a page, but they represent a reverberating cannon shot in a market where enormous, but precisely-metered engine output is almost always sanitized by automatic transmissions and torque-vectoring all-wheel drive systems. 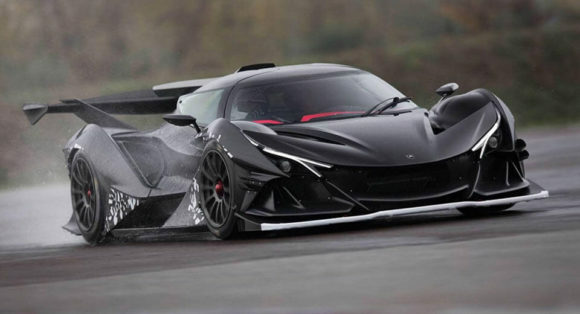 You’ll find neither in the Italian-built Apollo IE, with the instant throttle response of its naturally-aspirated, mid-mounted 6.3-liter V12’s 780 horsepower flowing almost unmitigated to the rear wheels by way of a six-speed sequential transmission, whose pneumatic activation rips like a gunshot over the intoxicating roar of the car’s triple-exit exhaust system. Your eyes aren’t deceiving you – that’s an actual third pedal nestled beside the IE’s brake, perhaps the only detail more brazen than the rest of the Apollo coupe’s cabin-by-Batman passenger compartment. With only 10 hand-built examples of the IE planned, the automaker is able to laser-target buyers seeking the sensation of touching the car’s 208-mph top speed unfettered by self-determining servos. Apollo Automobil doesn’t expect owners of the IE to stick to the streets. After all, why craft such a finely-honed, race-ready rocket without providing a proper, and controlled, venue in which to play with it? To that end, the automaker is in the midst of creating a Time Attack program to be launched later in 2018, coinciding roughly with the mid-summer delivery of the very first models. The series will allow IE drivers to sample some of the most challenging and historically-significant circuits in Europe, with the full support and service of the company behind them. In fact, Apollo’s owner involvement initiatives go well beyond the promise of providing a track day pit crew. In addition to being provided with an in-depth driver training program, whether they participate in the Time Attack series or not, customers are given the opportunity to fine-tune the development of their particular car as it goes through its continuous-development testing prior to being delivered. It’s a rare chance that moves beyond Apollo’s already-bespoke build process to have a final say in how each individual’s IE will feel out on the road. Reaching back into the past so as to preserve the future of driving is as noble a principle as one is ever likely to encounter in a world where automotive technology is increasingly used to box us in rather than set us free. With Choi at the helm, and Berris right there beside him, Apollo Automobil seems poised to spark a new era in hypercar design where the human element is at least as important – if not more so – than the numbers blinking back at you on a computer screen.